Hello world, I am 39 years old today. It feels exactly like the number—it feels like I am on the verge of something bigger. It doesn’t really feel like my birthday, save for the flurry of greetings on FaceBook and the ringing of my cellphone. I woke up early this morning to get to a job interview, but Fate intervened and waylaid me. Now when Fate suggests I abandon my plans and go elsewhere, I am wont to agree. So early in the morning in Monday-rush Makati, I paused for a coffee street side and watched the rest of the world go by, drinking in the rush of the day, but not joining in. It’s a skill I have, just sitting still and being an avid observer. Not so marketable, but a skill nonetheless. On the verge at 39, and yes, I can feel the ground shifting again. I got a call last week that promised a change is going to come. It did not surprise me, this promise of a change rearing its head all of a sudden. My first (and often truest) impulse is to accept it, to make room for it. I feel more than ready for a change, the same way I felt when change sidled up to me 2 years ago and invited me to pack up and move my life to Manila. At 39, fear does not strike me as sharply anymore. My life has shown me that there is nothing much (oh please) that I cannot survive. Maybe my edges have been blunted, maybe I just have a heightened sense of denial, or maybe I’ve grown an exoskeleton—who knows—I just don’t seem to feel as much anymore. I am not sure whether all this is good or bad. I’ve just resigned myself to it, that is all. So the 39th year is begun. Alright then, bring it on, give it all you’ve got. I’m more than ready, I’m raring to go! This entry was posted in The Bee, The Honey and tagged birthday, change, just think, manila, state of being. I thought I’d just jump in and get back on the blog horse, after quite a dry spell. That explains the picture here. I was wishing for a drink, and that night, my wish came true. A friend took me to the San Miguel Octoberfest launch, and the onslaught of rock music, alcohol, and people out to have a good time seemed to trigger a response in me. I had been in a tepid, debilitating, lowest-slung depression for months. I was plodding along with my eyes glazed over, going through the motions. It was not very sad, just exhausting. It felt like a desert spread out inside of me, covering every inch, eating through bone, leaving only dust. Outwardly however, I appeared the same. And testament to my ability to morph and blend in with the herd, no one noticed. I think I’m coming out of it now, though. Perhaps contact from long-lost friends helped, or maybe the oblivious jollity of new ones shook me out of it. Slowly, I’m finding the resolve to come away from that dark, dark place that swallowed me whole, and yet felt the safest. Rising from these slumps always feels like moving through traffic, gel-like, in slow-motion. But, I am moving now, and for the most part, that’s all that matters. Photo shared graciously by this pinoy at large. 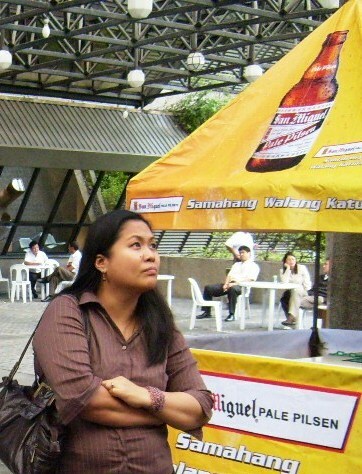 This entry was posted in The Bee, The Sting and tagged depression, drink, manila, not happy, sad, woes.